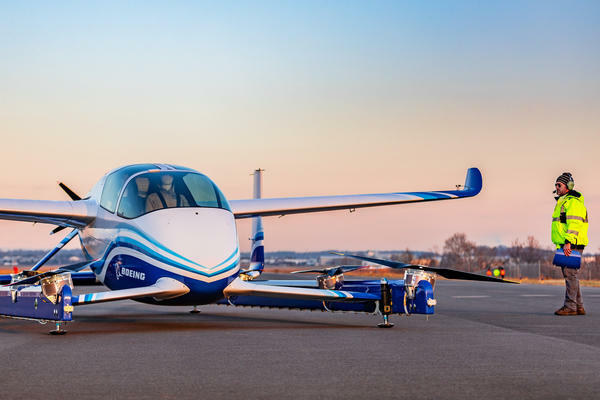 Boeing's Passenger Air Vehicle made its first flight at Manassas Regional Airport in Virginia on January 22, 2019. The two-seat Passenger Air Vehicle is an eVTOL (electric vertical takeoff and landing) aircraft or air taxi. The Boeing Company announced that one of its subsidiaries on the East Coast successfully completed the maiden flight of a self-flying air taxi. This comes almost exactly one year after a subsidiary of rival Airbus flew an autonomous passenger shuttlecraft for the first time in Pendleton, Oregon. Boeing's two-seat air taxi prototype took flight at the Manassas Regional Airport near Washington, D.C. on Tuesday. The unmanned, battery-powered first flight lasted less than a minute from liftoff to hover to landing. The Boeing prototype has eight rotors on struts for vertical lift and a propeller in the tail for horizontal flight. 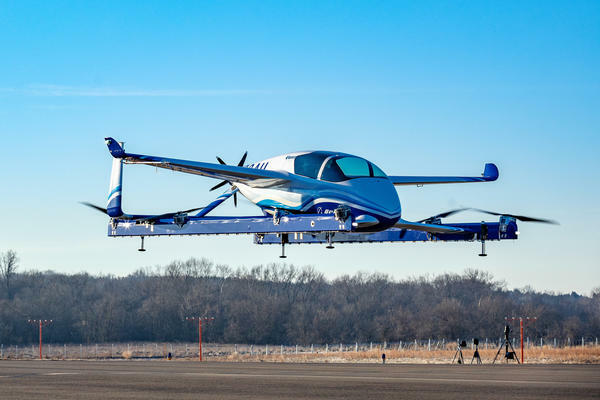 Boeing says the electric flying car has a range of about 50 miles. Aurora Flight Sciences, a Virginia company Boeing acquired in 2017, designed the prototype. Boeing dubbed the robo air taxi Passenger Air Vehicle, or "the PAV" for short. Meanwhile, Airbus continues to refine its own version of a self-flying air taxi. The battery-powered, tilt wing Vahana prototype is undergoing a lengthy flight testing program at Pendleton, Oregon's unmanned aircraft test range. The self-piloted, battery-powered shuttlecraft made its first flight on January 31, 2018. A spokeswoman at Aurora Flight Sciences said there isn't a precise timeline for commercialization of the PAV at this time. It’s expected to take years for these aircraft to get Federal Aviation Administration certification to carry passengers. For the next stage of flight trials, Aurora plans to test its prototype’s ability to fly forward – in addition to vertical takeoff and landing. A Boeing representative said the company would explore both two- and four-passenger variants as the concept is further refined. Since 2017, Aurora Flight Sciences has participated alongside other aerospace companies in Uber Elevate, the air taxi development arm of the global ride-hailing company. Uber has said it aims to begin commercial air taxi service in 2023 around the cities of Dallas, Los Angeles and an undisclosed international city. Boeing, Airbus, Uber and others have articulated similar visions for a future in which commuters would hail an air taxi through a smartphone app, which would then direct them to the nearest helipad to meet the aircraft. In a previous interview with public radio, Airbus Vahana Project executive Zach Lovering estimated the cost to the user per ride would be "on par with a taxi" fare over the same distance. Potential hurdles that could slow down the commercial rollouts include integrating air taxis with existing air traffic and the public's wariness of riding in pilotless aircraft. Boeing's NeXt division, which includes Aurora and the Passenger Air Vehicle program, has engineers working on air traffic management protocols and software. The Boeing NeXt division also has an autonomous cargo lifter under development. 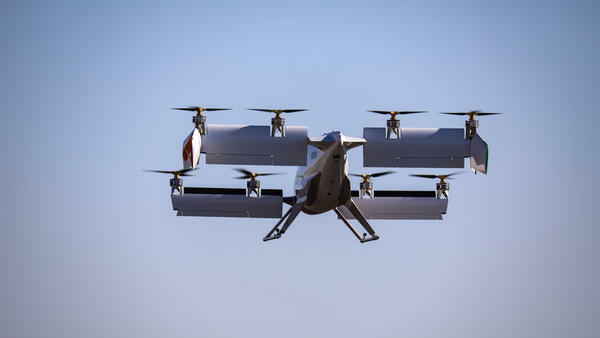 The urban air mobility space is a crowded one, with about 20 competitors around the world racing to develop passenger and cargo models. German startup Volocopter, China's EHang and Textron's Bell helicopter division are some of the others to watch.